The benefits of submitting performance data for ASA members. Editor’s note: Recently, ASA’s Jannine Story and Emme Troendle teamed up with Simmental producers Dr. Michael Dikeman, Sarah Jones, and Chuck Miller to explain the benefits of submitting performance data. The phrase “we’re all in this together” is certainly on the mark when it comes to our genetic evaluation program. Though a top-tier genetic evaluation system requires an engine built on cutting-edge technology, that engine will not get us anywhere without fuel. The fuel we speak of is data. No matter how high-tech the system used to calculate EPDs, achieving high levels of accuracy requires data — lots of data. Certainly, your Board of Trustees and staff are committed to keeping ASA on the cutting edge of technology. But the job of supplying the data falls in your laps — and this job may be as critical as anything we do in the area of genetic evaluation. Dr. Michael Dikeman points to the great value of reporting whole herd data and its relationship to carcass predictions. The value of increasing the data flow into our genetic evaluation is precisely why the Board of Trustees implemented a fee structure for Total Herd Enrollment (THE) that gives participating breeders a sizable break in exchange for providing ASA with a running inventory of their cow herd and an annual reproductive record on every breeding age female. “If you place an emphasis on EPDs when evaluating your cow herd or if your customers rely on EPDs for the cattle you sell, you should want accurate EPDs–accurate EPDs only come from participating in THE and the Performance Advocate program. You need to submit ‘all the data, all the time’!” says ASA member Sarah Jones, Red Hill Farms, Lafayette, TN. Red Hill Farms has been committed to collecting data for many years. Besides receiving discounted rates, breeders in THE help us all by providing a substantial amount of information to our database on the reproductive performance of our population — which ultimately increases the overall accuracy of our Stayability EPD. As can be seen from Table 1, we receive less data as time goes on. Though the drop in percentage over time is partly due to the fact that calves are lost to death and sale following birth, the percentages above lead one to the conclusion that our data collection efforts taper off to weaning and drop like a rock thereafter. Chuck Miller uses the data he gains from THE as a tool for increasing the reliability of data. To encourage more thorough reporting of performance data, a program was implemented that rewards breeders who submit records on all of their calves. The Trustees dubbed it the Performance Advocate program and any breeder who meets its requirements is listed annually in the late fall SimTalk and on ASA’s website as a Performance Advocate — a designation that should carry weight with the industry. To comply with the program, a breeder will have to submit calving ease scores and calf birth weights for every cow on inventory that calved during that year (whether its calf was dead or alive). From calving on, breeders need to be vigilant about using Calf Removal Codes to achieve Performance Advocate status. 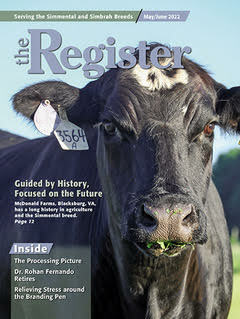 See the November Register, page 42, for codes. If a weaning weight, yearling weight, or hip height score doesn’t exist because the animal has been removed from the herd, the only way 100% compliance can be recognized is by applying the Calf Removal Code to calves that were not in your herd at the time of data recording. The level of compliance with the program can be monitored by logging into your account on herdbook.org. There you will find graphs indicating the proportion of your calves that have data recorded for each trait listed above. Hopefully, the capacity to easily monitor data submission and public acknowledgment for 100% compliance will increase data flow to the ASA. “Without measuring the full array of traits, breeders will not really know how well their genetics work for all segments of the industry,” Dikeman concludes, “Capturing data on all traits should keep breeders balanced in their genetic goals and demonstrate to potential buyers that their genetics are designed for ‘life-cycle’ beef production”. ← Simmental Celebrates 50 Years in America!